The Emma Goldman Theatre Brigade, a radical feminist theatre group, is at it again - implementing their innovative lottery system to insure theatrical equality. They each draw the role they will play out of a hat each night before the show, but tonight there's a critic in the audience and the sisterhood is put to the test when some of them don't draw the role they want. What follows is the trial of five women accused of denying Anastasia Romanov, the infamous daughter of Tsar Nicholas, of her identity where the audience becomes judge and jury. They rule on objections during the course of the play, creating a new show with every performance. 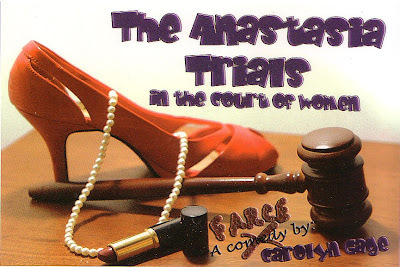 A courtroom drama based on history wrapped in a backstage farce with a healthy dose of audience participation thrown in for good measure, The Anastasia Trials in the Court of Women presents a profoundly engaging excursion into the interactions of women who are survivors and abusers. Featuring Beth Adler, Molly Church, Ashley Diane Currie, Dianna Lora, Emily Murray, Brooklyn Scalzo, Sara Towber, Nora Vetter and Lexi Windsor. Theater information and dates are listed below. Here is the thing: smaller theatrical productions, especially in an actor-heavy city like New York, are grossly underrated. This stagingis a perfect example of that: nine strong performances shine through in a play that is fast-paced, political, and yes, funny, while at the very least, complex for both the actors and the director. On the way into the small, intimate theater, one is given the playbill and two pieces of paper, one red and one green. The stage is very bare, consisting of nine black wooden chairs arranged like a courtroom. At the start of the meta-play, the actor who plays the character of "Betty" and "The Bailiff" comes onstage. She explains the audience’s part of being the judge and the jury, and depending on which colored card is held up, that is the direction the play follows. Just as the audience plays two parts, each person plays two (or more) roles, one of an actor in the meta play-about-the-play, and one of the characters of the play-within-the-play. I promise, the premise is not as confusing as it sounds: in other words each person plays an actor that will be playing a role in a play. Along the way, the two roles start to blend. This play is strongly taken from a feminist perspective, with so many of the “key words” and theories thrown in, such as patriarchy, collective, social justice, survivor/victim, male gaze; and yet, it is not anti-male, but rather puts the spotlight on women’s role within that patriarchy. It is not men who are on trial, but rather whether or not the women in Grand Empress Anastasia’s life were – in the language of Gatekeeping theory – willing participants or part of the hub; in other words, were they abusers, abused themselves, or both. It is actually a very smart and sharp perspective that looks within the sisterhood in a way that is not inclusive or off-putting. As a person married to a Women’s Studies scholar, I have long-time learned that feminism is not a singular thing, and there are an incredible amount of shades to the theory. What I find so exciting about this play is that Gage has deconstructed and then opened up these shadings, rather than presenting a black and white contrast. Presenting this is no small feat, and director Christine Vinh Weems has accepted the challenge and done an admirable job. It would have been quite easy for this to have been just a muddled mess in the wrong hands, but she has, with wise staging and tones, made sure that each actor is a autonomous and clear entity, even with the actors wearing relatively uniform “plain black dresses” (that in itself a wise choice in breaking down the classic “all women should have a plain black dress” mentality that is prevalent in our society and yet having everyone be so individualized. I don’t know if I’m supposed to be saying this, but due to this being a small production company with limited financial means, the actors have had to work around their own schedules, so from what I understand, getting all nine actors to rehearsals at the same time has not been always easy. In fact, by opening night, there had only been a few full run-throughs. Despite that (and I also believe firmly because of it), the whole company showed an amazing amount of togetherness, and yet were no feeling of being over-rehearsed, and that it felt like real conversations rather than line readings. Instead of sounding like the cattiness of The Women, it was more like, well, life. The cast is strong, showing many shades on a theme, and yet staying strongly within character(s), even when sitting to the side of the main action. Stately Beth Adler plays “Lisa,” the playwright within the play who also portrays “Baroness Zinaida Tolstoy” (a Romanov family friend), plays her part as the meta-playwright with arrogance, which makes her (purposefully) overplaying the aristocratic Zinaida all the more funny, and when she’s put to the test within the story, she shows wide emotional range. When the playwright herself is put on trial, her fiery intensity is evident. New York’s own Dianna Lora plays the strongly convicted “Marie”, who is lottery-given the role of “Clara Peuthert” (a fellow inmate of Anastasia in a German asylum who helped get her out of the hospital and opened up her home to her, but then forced her out when no money came her way). Dianna plays Marie as an activist (to her credit, without making her into a cartoon), and Clara as a drunkard who is both physically and verbally volatile. Plus, she singled me out in the audience pointing to me and giving me the stink-eye (which I totally enjoyed! Thank you Dianna). Molly Church embodies one of the more disagreeable characters in the play, making the most of the role. Her actor character, “Amy,” is smarmy, ready to blow off the “play” for a paying cabaret performance. One of the two antagonists of the play, who represents the “actor’s ego,” she is constantly fidgeting, wanting to get out of the theater. Looking bored and annoyed, she even texts on her Blackberry at points. Again, she takes what could have been a very annoying character and makes her human. Dislikable, but human nonetheless. Even when she plays “Sophie Buxhoevenden” (a Baroness who betrayed the Czar’s family, and then was chosen to identify Anastasia when she was in a German asylum), she plays her with impatience, unable to separate the Baroness from Amy. As director, Christine took literary liberty on how to keep Amy in the theater during intermission in a way that was exceedingly wise, and also allowed Molly a chance to do some fine and funny improv (along with the rest of the cast, as well). Emily Murray plays “Melissa,” who gets the role of Anastasia's nurse at the asylum, “Thea Malinowsky” (who knew the Czarina’s self-admitted identity, but did not tell anyone). As one of the first defendants at the trial, she sets up the direction of where the meta-play is going, and has a key part in some of the backstage intrigue that goes on by the “actresses,” in part thanks to her inviting theater critics to the show, which sets up a whole turn of events. Hers is a foundation role, and she handles it admirably. Lexi Windsor plays a character so different from a previous role I had seen her perform in The View From Here [see my review in an earlier blog], proving that she has a wide range. Here she is “Donna,” who is resentful of those in charge of the theater company. As “Shura Tegleva” (Anastasia’s former nursemaid and one of the only survivors of Anastasia’s family’s servants), she is played timidly, almost in a PTSD, reticent way. You feel for her, while wondering at her guilt. The role of stage-hand-turned-actor “Betty,” who plays the “Bailiff” in the meta-play, will be Brooklyn Scalzo (also an amazing photographer, for those looking for headshots! ), but thanks to a case of pneumonia, the role this night was filled in amazingly and admirably by director (who is also an actor) Christine Vinh Weems. She did such a terrific job in this exceedingly stressful role, a few people in the audience did not realize that she was not one of the regular actors (no announcement of the switch was publicly made). Let me state a “huzzah” in her direction, and hopefully I will get to see Brooklyn at some point in a future production. As “Diane,” the head of the “The Emma Goldman Theatre Brigade,” Nora Vetter has one of the more challenging roles as “The Prosecuting Attorney,” who must adapt her role dependent on the green or red cards held up by the audience (and also must convince the audience, as we are the judge). Nora is a strong actor with a wonderfully expressive face that easily conveys what the character is feeling. She was a joy to watch as she both prosecutes the defendants, and defends her theater company from the political goings on within the troupe. Another strong and difficult role that can vary with public opinion is played by Ashley Diane Currie, who plays the aptly named rich-girl part-time actor/part-time law student “Athena” (Greek goddess of wisdom), who wrangles her way into playing “The Defense Attorney”. She plays her character (correctly) strongly stiff and self-righteous as a perfect foil and antagonist to protagonist “Diane,” who is accommodating and trying to please. It is Athena who takes the meta-play out of its mold, and turns it on its head, again a role that could have just been “bitchy” in the hands of a less capable actor, but Ashley really pulled it off. Her short turn as defendant “Annie Jennings” (New York socialite who invited in and then kicked out Anastasia) is intense. 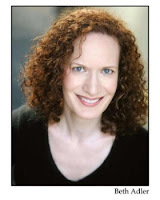 Last, there is Sara Towber (who runs the real theater production company, Little Hibiscus). She plays the physically ill “Jenny,” who opts for the titular “Anastasia” role. In the meta-play, her character has no lines (other than some pained shrieks) and sits under a blanket through the whole show (Anastasia had been known to do this). As the meta-play takes its twists and turns, she peeks out to see what is going on (much to the chagrin of the other characters). And although she is dialog free for most of the show, her impassioned role is the heart of the play (and, as was mentioned afterwards, is probably closest to what Gage felt when she wrote it). Sara is slight, has a strong comic air about her, and has a high-pitched voice, so she is actually the perfect one to take this role and turn it on its ear by effectively playing against type (much as the deep voiced Tim Curry played the fey Frankenfurter). Again, this shows the excellent measure of the actor. In the original written direction of the play, the instruction is that only the women in the audience are supposed to vote on innocence or guilt (as this is the Women’s Court). This was not so at my performance, where everyone had a say, but with a small theater, every vote is needed and it did not feel like it was a betrayal of the author. Actually, it felt truer in what I have seen as the new direction (third wave? fourth wave?) of feminist social justice, which is one of inclusion rather than separation.